Sometimes when life gives you lemons, making lemonade isn’t really in the cards. I had a great weekend. A relaxing night at home with this chard gratin and my honey on Friday, a bridal shower on Saturday that my sister and I attended together, lots of snow, and making lunch for my relatively-soon-to-be parents in law Sunday afternoon. Then…wham. 3 AM Monday morning, I’m hit with a pretty ugly little stomach bug. Did it not know that I have blog posts planned, like this one that was supposed to go up Monday? I’m also trying to work ahead a bit in the recipe testing department, since I’ll be away and without a kitchen for a week very shortly. As I write this Monday night, mostly recovered but still a little achy and off, I’m not sure on my exact plan for catching up, and that’s okay. If 24 hours of downtime causes that much panic about my schedule, then maybe I need to relax a bit anyway. The good news is I’ve had the day to let my body recover (by sleeping until 1 PM), I survived just fine without the crazy train of thoughts and to-do’s going through my head like most other days, and I got to spend a little extra quality time with Steve tonight in front of the fire, eating the only thing whose sight doesn’t immediately repulse me–miso soup and a sweet potato sushi roll. Given the whole stomach thing, I won’t go into three paragraphs of detail about these gratins, at risk of relapsing. Putting myself back at Friday night, they were so delicious at the time–bubbling with béchamel and Gruyere cheese, plus a ridiculous amount of healthy greens. 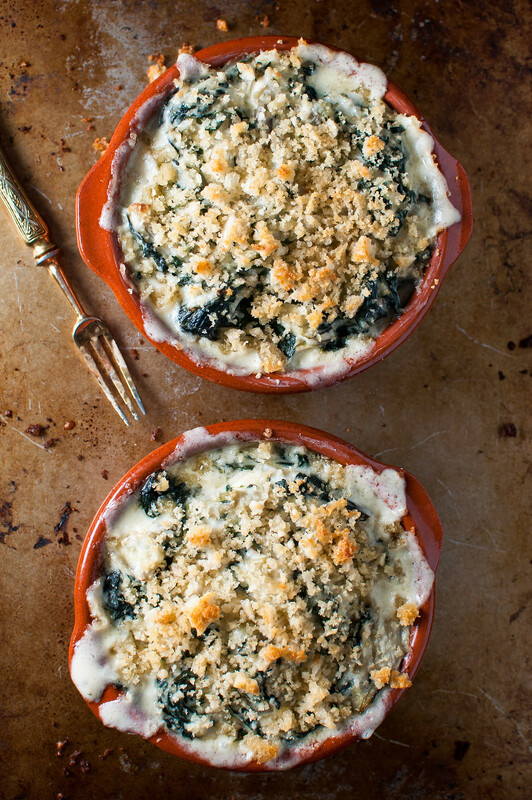 Yes, there is approximately one bunch of chard per gratin. I was thrilled to find good-looking, organic greens on sale for $1.49 a bunch, but it’s not always that cheap. If you’re on a tight grocery budget, pin this one for spring and summer as greens come into season at the grocery store and farmer’s market. I’m hoping that by tomorrow all memory of stomach issues will be gone and I’ll be ravenous for this last leftover gratin. Meanwhile, I’ll be taking my first hot bath in something like years–maybe I did make that lemonade after all. These make the most rich and creamy little meatless dinners you could dream up. 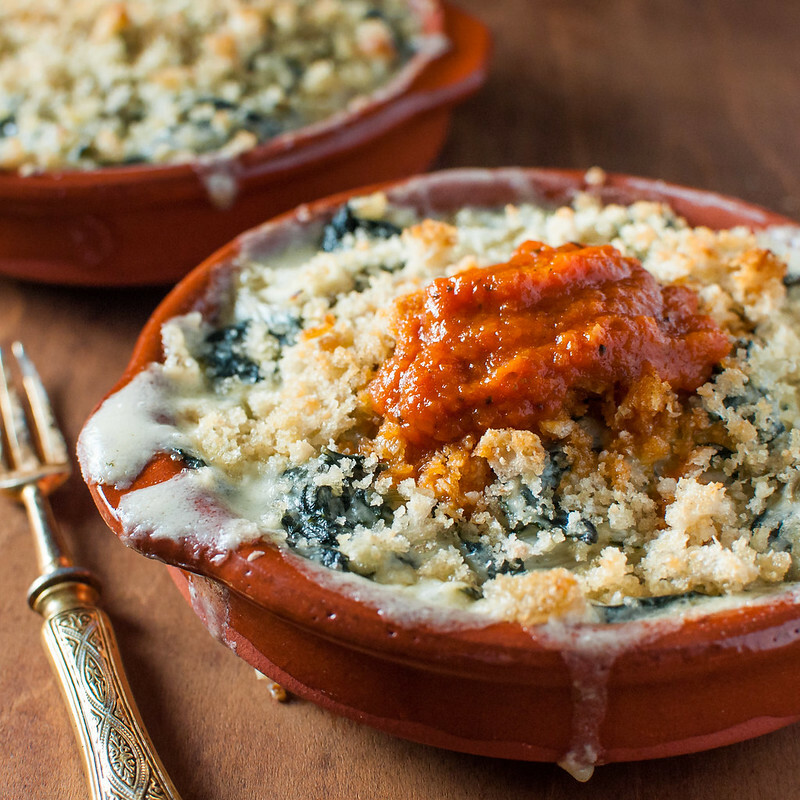 In place of the sauce here, use a good, purchased marinara or this Natural Comfort Kitchen red pepper sauce, omitting goat cheese, cream, and chard. Wash and dry red peppers and lightly coat with olive oil (about ½ teaspoon each). Place on a foil lined, rimmed baking sheet and broil six inches from heat, about 10 minutes, until blackened on top. Carefully rotate peppers 90 degrees, broiling 5 minutes each on remaining 3 sides, until the peppers are charred and mostly blackened. Place peppers in glass or metal bowl, cover with a dish towel and dinner plate and leave alone for 15 minutes. Remove skin, stems, and seeds from peppers without rinsing. Roughly chop peppers. Heat remaining tablespoon oil in a medium skillet or saucepan. Add onions, ¾ teaspoon basil, ½ teaspoon marjoram, chopped peppers, and salt and cook until onion is softened, about 10 minutes. Add wine and cook until mostly evaporated and sauce has thickened. Add tomato paste, tomato puree, and water, and simmer partially covered until slightly reduced, about 25 minutes. Turn off heat, cool slightly, then puree with an immersion blender. If desired, simmer further to reduce for a thicker texture. Off heat, add vinegar and stir in butter until melted. Before serving, stir in remaining ¾ teaspoon basil and ½ teaspoon marjoram, plus additional salt if needed (particularly if sauce was made ahead). Butter 4 ramekins (about 1 cup each) and coat with ¾ tablespoon each of the grated parmesan. In a large pot, heat 1½ tablespoons oil over medium. Add chard stems and cook until softened, about 8 minutes. Add chard leaves to fill the pot, cover, and cook 1 to 2 minutes until beginning to wilt. Add remaining chard in batches as it fits, covering to wilt each time, until all chard is completely wilted. Drain in colander, pressing down with a small plate to extract almost all moisture. Toss with ½ teaspoon salt and ¼ teaspoon pepper. Gradually heat milk in small saucepan until just boiling, then remove from heat until needed. Melt butter in a medium saucepan, then add and cook shallots and garlic until softened, about 5 minutes. Sprinkle in flour; cook and stir 3 minutes as roux bubbles slightly. Whisk in warmed milk until thoroughly combined and bring to a simmer while whisking. Reduce heat to maintain a gentle simmer and cook 15 minutes, stirring or whisking frequently to keep flour from settling. Stir in half and half, then season with salt, pepper, and nutmeg to taste. 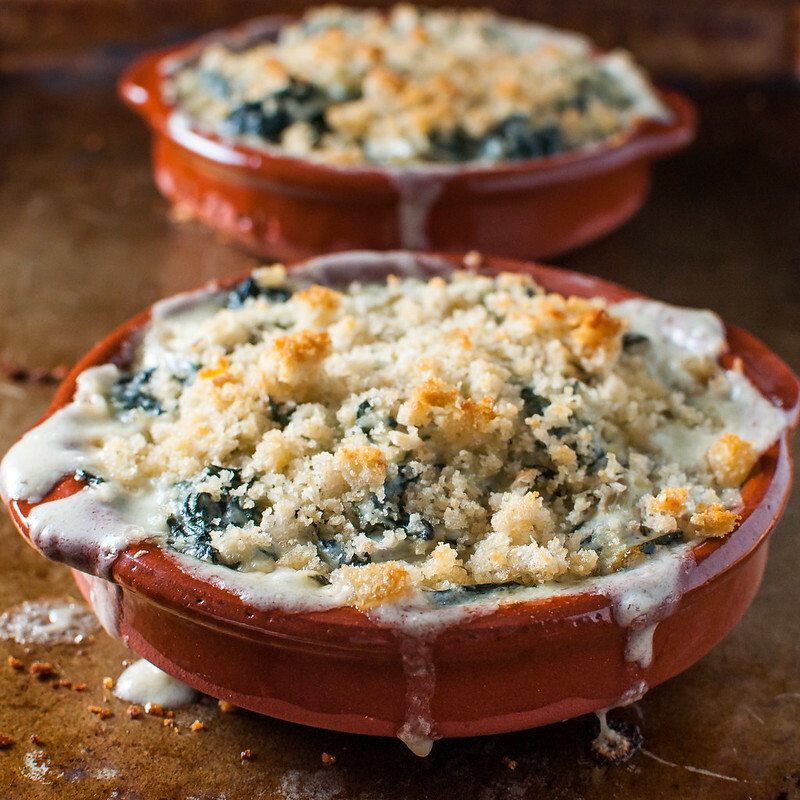 Wipe the chard pot dry, and use it to combine chard, béchamel sauce, 5 tablespoons parmesan, and gruyere. Divide mixture evenly among prepared ramekins. Mix bread crumbs, a tablespoon of parmesan, and remaining tablespoon of oil in a small bowl. Divide this crumb topping over the ramekins, place them on a rimmed baking sheet, and bake on middle oven rack for 25 minutes, until bubbly and beginning to brown. Serve topped with warmed red pepper sauce, with extra sauce presented at the table. Cook time is for gratins only. Total cook time for red pepper sauce is approximately 1 hour. To ensure the dish is strictly vegetarian, use vegetarian parmesan or a vegetarian parmesan cheese substitute. Make the red pepper sauce in advance and refrigerate a few days or freeze for a longer period. Gratins can be assembled a couple days in advance. Allow to rest at room temperature about one hour before baking, or add 5 to 15 minutes to baking time, until bubbly and breadcrumbs are browned. Note: This page contains affiliate links. It does NOT contain sponsored content. Affiliate links (to products I recommend, on Amazon) offset my ingredient and website maintenance costs, so I can keep bringing you bubbly recipes like this one. Thanks! 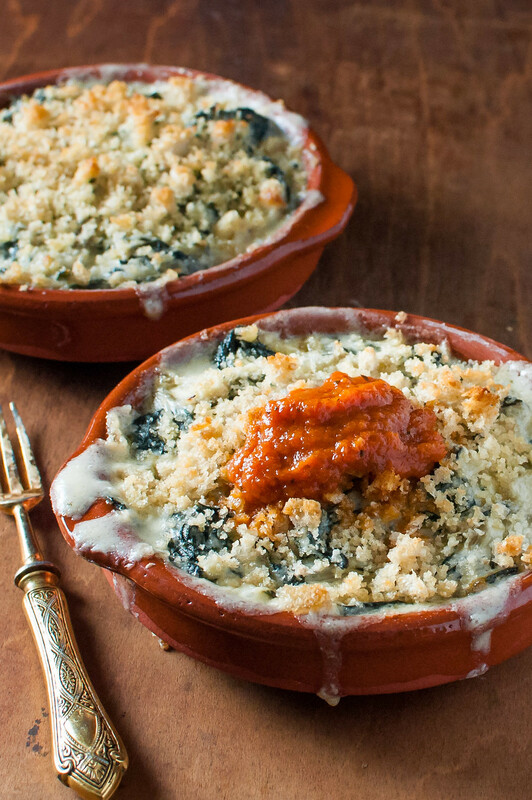 I’ve only ever made potato gratin before.. and after seeing this post Tessa you have inspired me to try out this chard and roasted red pepper version. Looks and sounds delicious! Thanks! Be prepared it is SUPER filling. My fiance finish his ramekin, but I couldn’t make it through mine. I served it with a simple quinoa and potato salad, if you need ideas for a side. I have made these a few times now and it honestly one of the most scrumptious, luscious things to ever come out of my oven! Seriously, people, make this NOW! Oh my goodness, what a compliment! Thank you Caitlin! Ah this looks so good, reminds me of chicken eggplant parmesan but no doubt lighter and healthier. Mm hmm, going to have to upgrade my bachelor cooking skills a notch or two for this recipe, but I’m sure it’ll be well worth it! Great, this sounds delicious. Going meatless and looking for vegetarian alternatives to my favorite meat dishes-makes the transition easier. Even better I can get the herbs, tomatoes and chard fresh from the garden all summer. May try kale in place of chard to mix things up. What do you think? Kale would be awesome in it! Even sturdier and “meatier” than chard. And with everything fresh from the garden I’m sure it will be even better! The would go great w/ roast prime rib at Christmas as a side dish. For me I’d would be dinner but my guests are meat & potato people. If I used one casserole dish do you think the baking time would change? 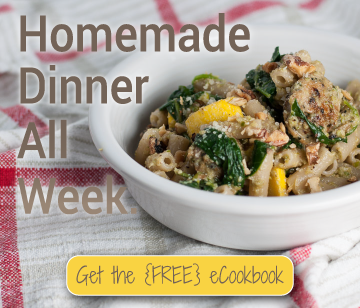 I love the idea of preparing the dish 2 days prior then finish in oven day of dinner. Hi Aneemarie–that’s a great idea. It shouldn’t change too much with a single dish. If anything, going straight from refrigerator to oven will add a little time, since you’re starting with a cold dish and cold food. Try to let it sit out at room temperature for 30 minutes to an hour before baking, then judge doneness based on when it’s bubbly at the edges (or taste a little! ).